One of the challenges we face as guitar players wanting to incorporate leads into our playing is being able to move between scale positions. We learn all of the patterns, but typically rely on one or two boxes for our leads. In this lesson, we’re going to look at how we can use the root note to easily navigate major scale positions on guitar. This will help open up the fretboard and get you moving all over the neck. When first learning major scale positions on guitar, it’s common to learn each position in succession. You learn the first position, connect that to the second position, connect the second position to the third position, etc. The problem this causes is it builds a relationship between the connecting patterns. In order to find position three, you first have to find position two, which requires you to first find position one. Because you’re not able to identify scale positions independently, it makes you feel locked into one or two scale boxes. So how can we begin to view these positions independent of each other and easily jump between them? By using the root note of the scale. Every position of the major scale will have at least two occurrences of the root note, with positions 1 and 5 having three. The root notes of each position are always located in the same place relative to the other notes of the scale. This creates memorable root patterns that can be associated with a scale position. Because these patterns are based on intervals, they are the same across all major keys. Position 4 of the G major scale will have the same root pattern as position 4 of the C major scale and so on. In addition to root shapes, each occurrence of the root note connects two scale patterns. This gives us another way to relate root notes to scale positions. 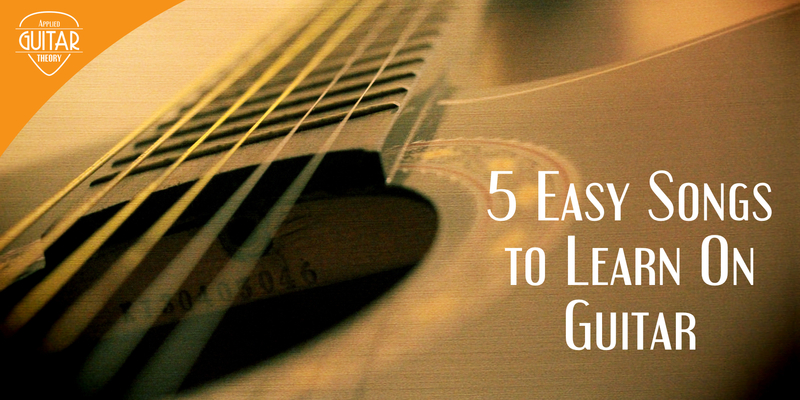 The examples in this lesson use the G major scale, but again, the scale patterns remain the same regardless of what major key you’re playing in. When the root on the 6th string, you get position 5 above and position 1 below. The root on the 5th string connects positions 3 and 4. The root on the 4th string connects positions 1 and 2. With the root on the 3rd string, positions 4 and 5 are connected. On the 2nd string, the root connects positions 2 and 3. Since the notes are the same on the 1st and 6th strings, the root on the 1st string connects the same positions as the root on the 6th string. Positions 1 and 5 are connected by the root on the 1st string. The following are some exercises you can do to get familiar with moving from position to position by using the root note. While these exercises are using the G major scale, you should practice in other keys as well. 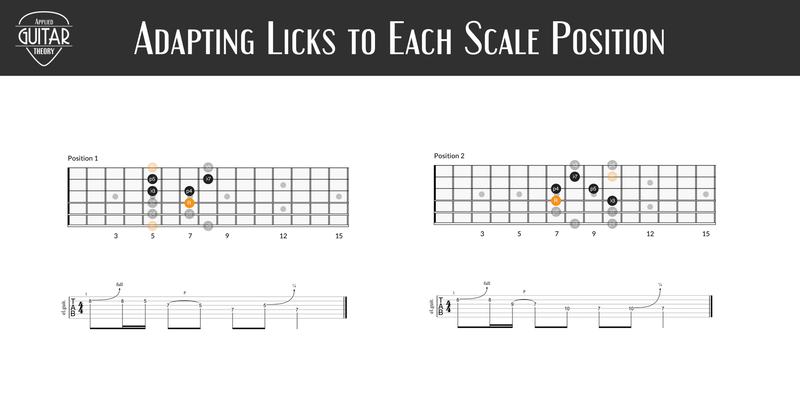 Keep in mind that the purpose of these exercises is just to increase your familiarity with the scale positions and help you easily identify any position on the fretboard. When playing the scale, start on the root position and play both ascending and descending across the fretboard. Be sure to end with the root note on which you started. 1. 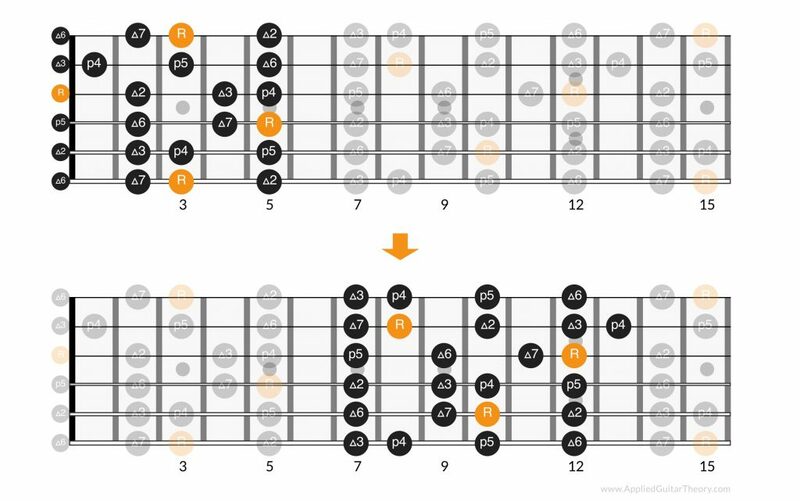 In this first exercise, you start with the root on the 6th string and play both patterns connected by the root, then move across to the root on string 5 and do the same. Continue across the fretboard until you’re starting on the root note on the 1st string, then come back across to the 6th string. 2. For the second exercise, you play the 5th position starting with the root on the 6 string and move to the 2nd position with the root on the 2nd string. Come back to the root on the 6th string and play the first position, then move back to the root on the 2nd string and play the 3rd position. 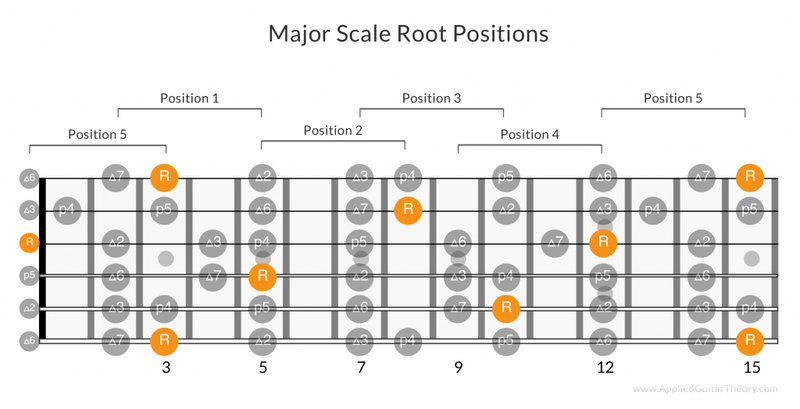 You can apply this exercise to any other root positions on the fretboard as well. 3. With the third exercise you start with any root note and play a scale position, then move to another root note and do the same. The only rules for this exercise is you have to play all scale positions and you can’t play two consecutive scale positions that are connected by the same root. There’s nothing magical about these exercises. The point is to be able to identify scale positions all over the neck. Feel free to play around with it and create your own exercises. 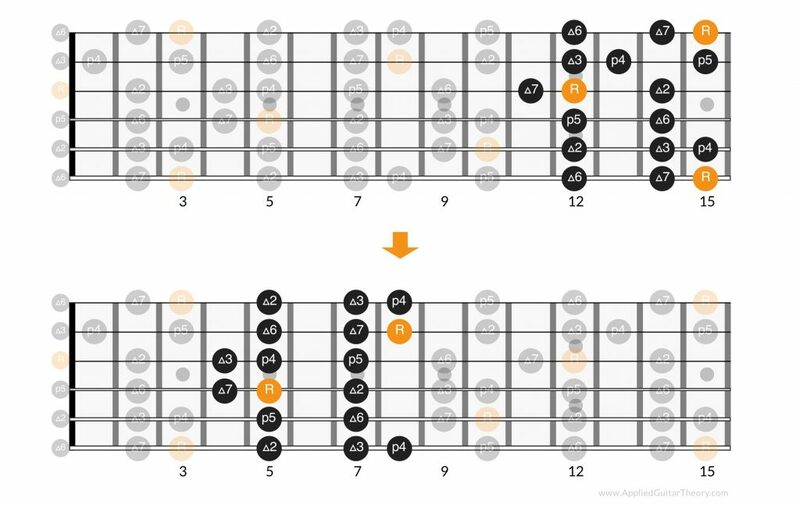 When learning the major scale positions on guitar, it’s important to be able to identify the positions all over the neck and not be limited to the patterns that are connected to each other. 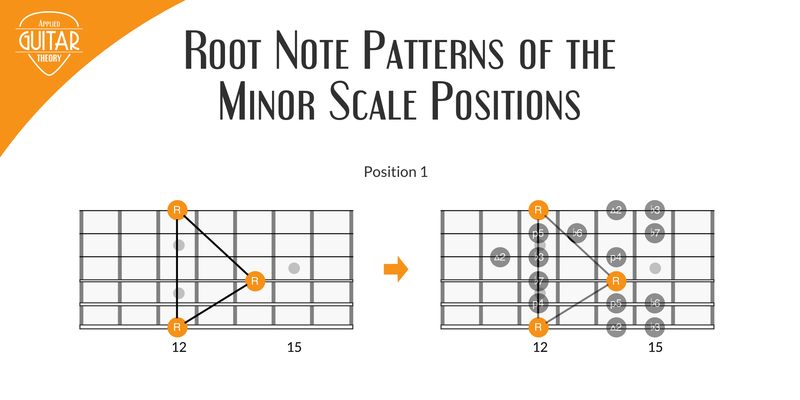 Associating root notes with scale positions is a starting point that helps with this process.